Since this snake probably came into the United States with imported plants it sometimes is known as the "Flower Pot Snake." The Brahminy Blind Snake looks somewhat like an earthworm. The adult is shiny and dark brown to grayish black in color with a somewhat lighter lower surface. The lower lips, chin, throat and tip of tail may be yellow to white. Earthworms, however, are segmented with noticeable rings around their bodies. 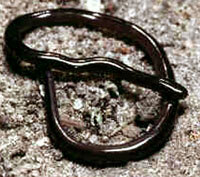 The Brahminy Blind Snake, like other snakes, is not segmented. Also, earthworms can stretch their bodies out increasing their length, and they can shorten their bodies. The Brahminy Blind Snake cannot do this. The head is the same size as the body without a noticeable neck. The small, dot-like eyes are covered by translucent scales. There is a tiny spur at the tip of the tail. The scales of this snake are smooth and shiny. This is certainly the smallest snake in Ohio, and it is one of the smallest snakes in the world. In fact, some authors claim it to be the smallest. The Brahminy Blind Snake originally lived in southeastern Asia. With expansion of worldwide markets, sellers of greenhouse materials (live plants, potting stuff, packing substances) have carried it to other tropical and subtropical parts of the world, including Mexico, Florida and Hawaii.. There is only one confirmed report of this snake having been found in Ohio: a greenhouse in the northeastern part of the state. Nevertheless, it should occur in other parts of the state wherever there are greenhouses and sale of potted plants. It is found in urban and agricultural areas in Florida. In Ohio it has been found in greenhouses and may show up wherever potted plants are kept. This tropical/subtropical snake lives in soil, plant litter and rotting woody material in areas that are warm enough to support it. In Florida it often is found in gardens and flower beds. 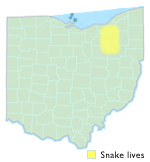 In Ohio it can survive only in protected places such as greenhouses and dwellings.